This past weekend four fabulous volunteers dedicated a Saturday to help remove Scotch broom at The Nature Conservancy’s Livingston Bay property. When we first arrived at the site the volunteers were somewhat overwhelmed by the Scotch broom to be removed. However they wasted no time at all rolling up their sleeves, putting on gloves and started working. With some hard work, sweat and good cheer the results were tangible and immediate. 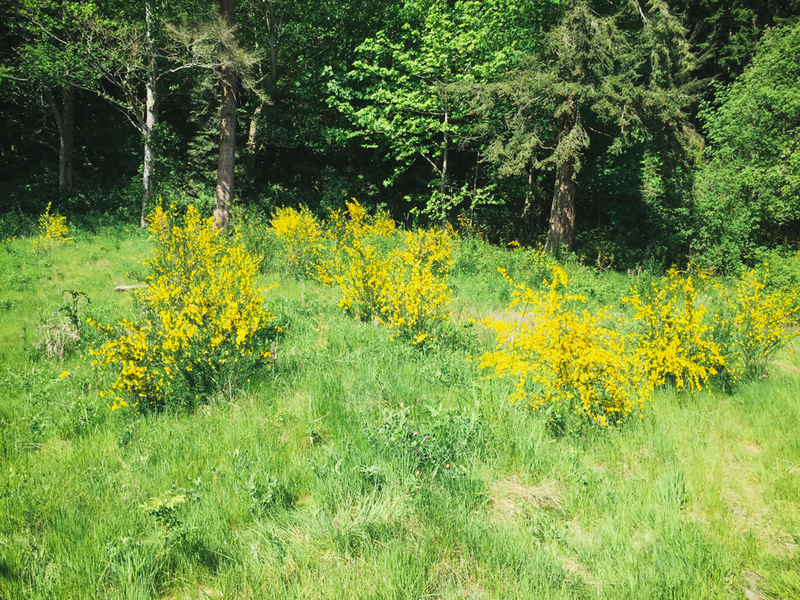 What is Scotch broom? It’s a noxious weed / shrub that grows from about 3 to 10 feet tall (although I’m sure we removed some larger than that). It’s got bright yellow flowers this time of year and if you travel along Interstate 5 it would be hard to miss. Why is Scotch broom control necessary? It’s like most noxious weeds and invasive plants, it grows aggressively and prolifically choking out and outcompeting native plants that provide essential habitat of wildlife species. The seeds are long lasting and remain viable in the soil for 30 - 80 years. Where is it from and how did it get here? Scotch broom is originally from the British Isles and Central Europe. It was introduced in the mid-1800s as an ornamental plant and planted in places that were prone to soil erosion. What you can do to help control it? There are a variety of control techniques from herbicide to biological controls to manual removal. However as one of the fabulous volunteers pointed out this past Saturday, consistent and dedicated manual removal multiple times a year before plants set seeds will lead to successful results. It is always a pleasure working with volunteers but these four were inspiring. One volunteer regularly patrols her neighborhood for weeds in Seattle removing ivy, blackberry and other weeds in common green areas as well as removes litter – taking care of her community. Another gentleman is a regular volunteer at The Conservancy’s Ebey’s Landing Preserve and has contributed so many hours that he is now keeper of The Conservancy’s weed wrench (special tool for removing Scotch broom). Their commitment and dedication to conservation is motivating! Thank you!